Why are you making this important change in your diet and lifestyle? In this first step, work from a place of infinite possibility and resources. This is not the time to think of why you won’t/can’t/don’t want to make a change, but why you do. The reasons for forging a plant-based diet are many. Get in touch with your own motivating factors: Are you devoted to a cruelty-free diet? Do you want to make a positive impact on the environment by switching to a more earth-friendly and sustainable diet? Are you interested in discovering new foods and having a more diverse and nutrient-dense diet? Do you want to support friends or family who are plant-based by aligning your diets? As we know from the top of every Modo class, setting an intention is powerful! Intention can help us stay on track when we have an aberration in our new or desired behavior. Maybe your intention is to learn more about plant-based diets, to eat vegan x days per week, or to slowly transition to a vegan diet over the course of the next year. Similarly, you might set an intention to not financially support industries/companies profiting from the exploitation of animals, reducing or eliminating the money you spend on groceries, personal products, or meals with animal products. This so-called “freegan” approach leaves room for well-intentioned non-vegan meals and gifts prepared for you by others. It’s overwhelming! How can I fully eliminate animal products from my lifestyle? Simplify. What is the next step you can take in a plant-based lifestyle? Give yourself permission to come back to this simple challenge over and over. Go plant-based over the course of a full year? It’s so slow! It’s slow like growing your yoga practice is slow. It’s slow like getting to know a new friend is slow. It’s slow because you are making lasting change. If you thrive off of seeing progress, set up a tracking system for yourself―a simple piece of cardstock with a sticker for every day you ate plant-based on your refrigerator―or schedule a monthly reflection hour to look back on the challenges and successes of the last month. I’ve tried before and I just can’t do it. YES YOU CAN! Your previous work is valuable experience for your continued path. You may venture off the path time and time again, but you can always come back. Abstinence can be powerful, but harm reduction might be the most realistic and effective way to make lasting change. I’m worried about how this change will affect my time with friends/family. You may have to take the initiative if your friends and family are not familiar with a plant-based lifestyle. This could mean introducing them to new, cruelty-free personal care products and foods. However, be sensitive to your communities’ own unique set of thoughts, feelings, values, and desires. Take a live and let live approach but stand firm in your ability to be the authority on your own lifestyle. Consider checking in with a buddy who is also making new changes in their lifestyle. I bet many of our fellow Sangha members would like to support you on your journey. I would! Identify other things that might be in your way. Take time to sit down and compose your thoughts, feelings, values, desires, and fears around this journey. The better you understand your motivations and your barriers, the more likely you are to succeed! Continue to check in with yourself on your journey. What is working? What isn’t? What simple changes might help you stay on the path? 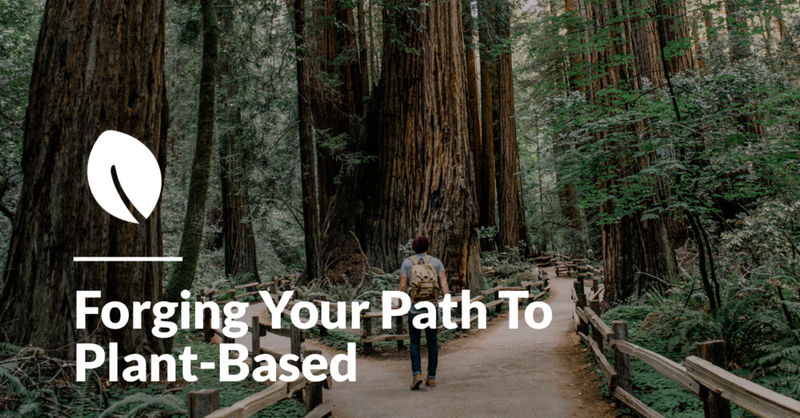 How can you find your way back after stepping off the path? What worked in January might not work in June. Be open to change and believe in your ability to adapt.